I read the whole book! CLI’s most significant accomplishment may be raising expectations for what 4- to 10-year-old students from high-poverty neighborhoods are capable of achieving. Our work has countered the myth that children from disadvantaged households have too many obstacles to overcome to reach the literacy levels of their more privileged peers. 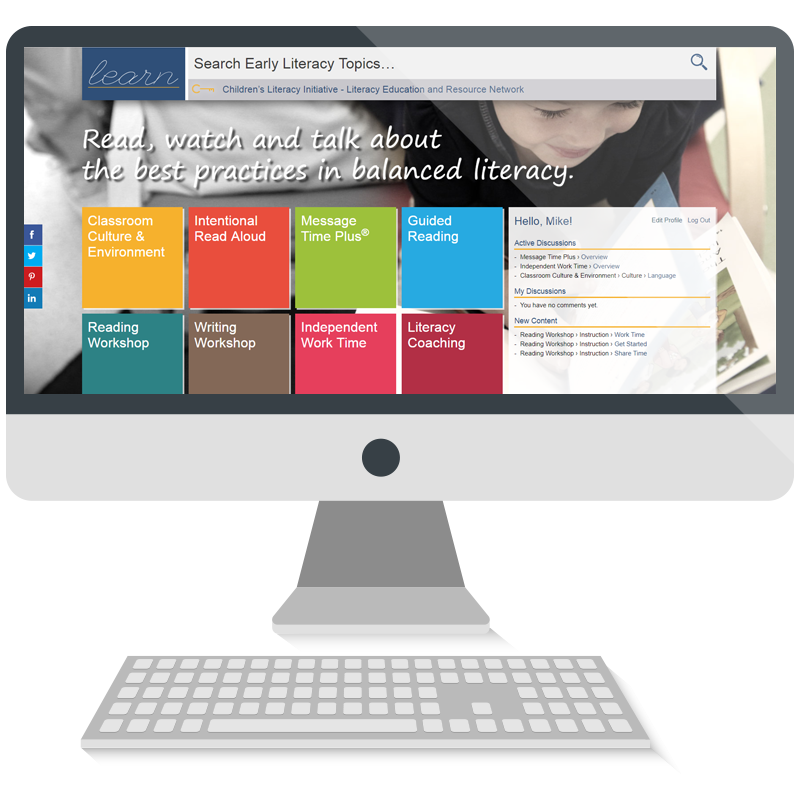 Instead, we have demonstrated that when instruction is expert, almost all children will learn to read. 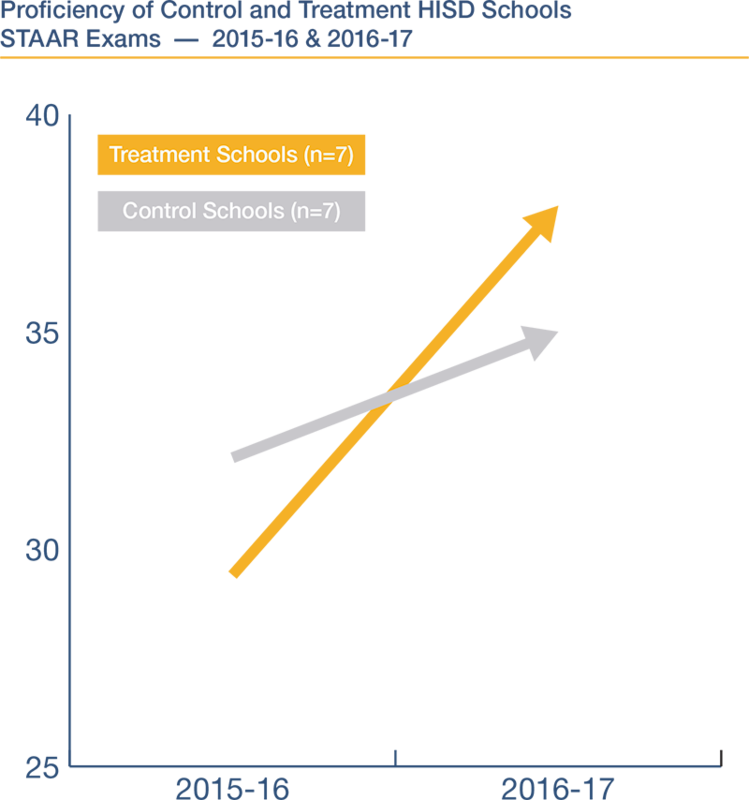 In HISD, schools with CLI services demonstrate more pronounced growth in the percent of third grade students who scored proficient on the STAAR Reading exam between the two academic years. The i3 Houston implementation timeline looked as follows. The size of the box for each service is not necessarily an indicator of how long a service takes to complete but indicates when a service should occur. 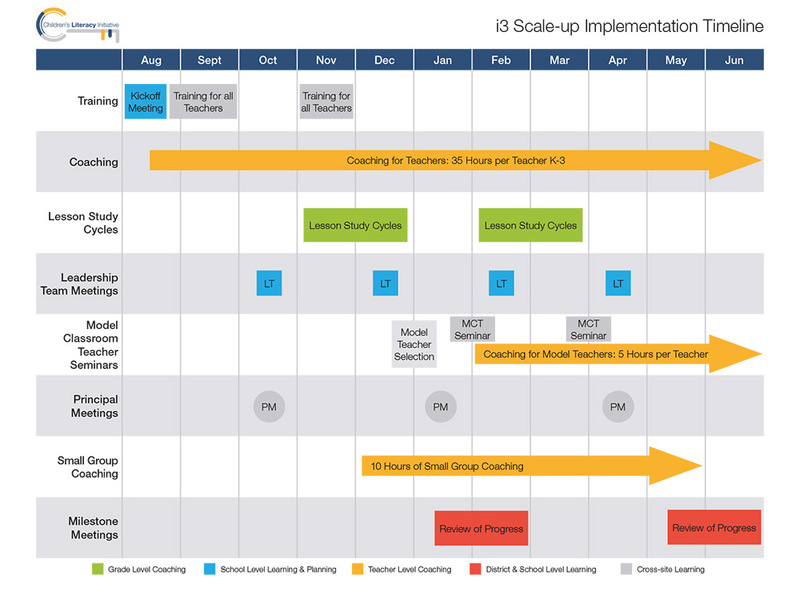 For example, a Lesson Study Cycle does not take two months to complete, but should happen during the months of November and December. CLI follows teachers from the training room to the classroom with tailored high-quality coaching in dosages that research and our own evaluation indicate are necessary to impact student learning. We also provide teachers with the books and materials necessary to execute the best instruction. Our services can help a good school become great. Holm Elementary in Denver, Colorado is a great example of this. In the 2015-16 school year, prior to working with CLI, Holm scored at 74%, qualifying as “Meets Expectations” for their School Performance Framework rating. The following school year, 2016-17, following a full year of working with CLI, Holm scored at 81%, qualifying as “Distinguished,” the highest possible rating. At Plantation Elementary in Broward County, Florida we made great strides in student achievement. In the two years before CLI implementation, there was steady improvement, increasing from 20% to 28%. In 2016-17, Plantation’s student achievement increased to 56% after one full year of CLI implementation. Committed and widespread CLI implementation within a district can lead to improvements in student achievement. We have worked within a majority of School District of Philadelphia K-3rd grade classrooms since 2015. With our help, district third-graders’ English Language Arts proficiency levels improved 5 percentage points — from 30% in 2015-16 to 35% in 2016-17.